The proverbial giant pizza stand built in its place—a windowless entertainment mecca and a cramped, dank cavern of a transit hub—was, at the time, imagined as a very futuristic architectural solution to the problem of an aging city. Today, the most tangible problem is Penn Station’s size: the number of passengers that move through the cavernous space has tripled since the 1960s. It’s a void in a piece of urban fabric already dense with featureless facades and billboards. Sarah Goodyear points out that Vincent Scully Jr., the architectural historian, probably said it best: Through the old Penn Station, "one entered the city like a god." Through the new Penn Station, “one scuttles in now like a rat." So the opportunity to give it another shot—third time’s a charm, right?—is tantalizing. To get the conversation started, the Municipal Arts Society invited four New York firms to imagine what Penn Station Part III could look like. Look is the crucial word here, though: the problems of Penn Station are more complex than what it looks like. So why are we talking about it in terms of aesthetics? Everyone loves an image of a glimmering, sunlit building of the future. But are beautiful renderings a sound basis upon which to solve a problem that involves civil engineering, transit, zoning, and economic development? New York Times critic Michael Kimmelman has the most sensible solution to the problem, of course. Last week, he suggested renewing Madison Square Garden’s operation permit for ten years, rather than the current plan of fifteen. A decade would give us just enough time to come up with a more thoughtful plan, involving stakeholders, experts on all fields, and case studies from other sites. And the architects, of course, who shouldn’t be vilified for their optimism. The question is whether we’re capable of the restraint and coordination necessary to think before we jump. According to a history of the second Penn Station written by Eric Plosky in 1999 (available here), most critics of the era weren't optimistic. In 1950, the editors at TIME magazine described New York's unique metabolism for architecture thusly: “Nothing makes a New Yorker happier than the sight of an old building rich in memories of the past; unless it is tearing the damn thing down and replacing it with something in chromium and plate glass, with no traditions at all." Check out the four proposals below. Diller Scofidio + Renfro, with Josh Sirefman, describe their formalist proposal as "a city within a city, a porous and light-filled civic structure filled with diverse new programs that reflect the hybridity of contemporary urban life." In scope, it's similar to the transit hub planned for San Francisco. Whether or not the sinuous curves and elastic structures support a well-design system is up for debate. "SHoP imagines an expanded main hall of Penn Station as a bright, airy and easily navigable space that defines a center of a new destination district, Gotham Gateway," explain the architects. "In addition to striking public architecture, the project proposes significant security and rail capacity improvements that address major needs at the existing station." The pros? The core focus is connecting the High Line to the pedestrian areas around the station, which would improve access. The cons? The "tower-in-the-park" typology hasn't been very successful in New York thusfar. Public plazas in Midtown tend to end up as ghost towns. H3 Hardy Collaboration Architecture would relocate Madison Square Garden to a pier on the Hudson River and expand the current Penn Station. Their proposal is the only to lay out the problem in terms of actual transit-users, which is a heartening thing to see. 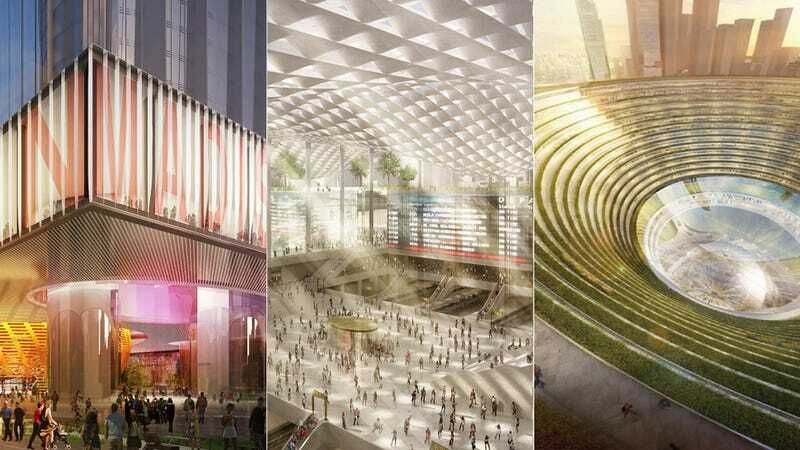 "The New Penn Station, including an eight-track high-speed rail expansion to the south, accommodates increased capacity and integrates community and traveler amenities, including a new 3 acre public park, retail complex, and 2 acre roof garden," the architects write.